The Fairyland Story - WHAT IS "DRACOLISK"? WHERE IS THE DIAMOND? We have a new champion. This is even more pointless than the Space Invaders DX page. Every character created by Taito is contractually obliged to make a cameo in at least two games after their initial creation. Even characters like the dude from Ben Beroh Beh and Operation Wolf veteran Roy Adams have made cameos in other games! Ptolemy and the cast of The Fairyland Story are no exception, and while this list is probably far from definitive, here's all the appearances we've spotted of the FLS crew. Of course, those of you who are particularly proficient at late-80s arcade games already know the first game that had a cameo of the cast of The Fairyland Story- it's 1987's Rainbow Islands. Taito's classic vertically-scrolling platformer has three secret islands, only accessible to those who collect all the Big Diamonds in the first seven islands (one per world, collected by getting all the Little Diamonds on an island). The first of these three is Magical Island, based on The Fairyland Story. As well as a kickin' remix of the main theme of the game, the Pig Soldier, Mage, Priest, Ghoul and Golem enemies all appear, and even the Worm shows up (as one of the most annoying enemies in the game- he'll leap up out of nowhere then dive-bomb straight back down again). 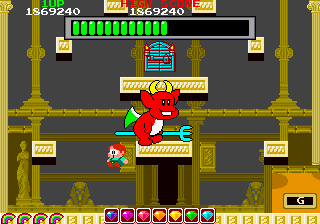 Also, since the game already had a dragon boss on Dragon Island, the boss here is the time-up demon. No cameo from Ptolemy herself, though. Also, in the Extra Version, the second island is Combat Island with the Magical Island enemies and music. Most home ports of Rainbow Islands (except the PC-Engine CD and FM Towns versions) excised the Magical Island (and all the secret islands) but the Europe-exclusive Game Boy Color port, released in 2001, not only has all the secret islands (even including the NES-exclusive Kiki Kaikai island) it also has two additional cameos from Ptolemy- she appears alongside an unnamed clone in the static cut-scenes before you start Magical Island and after you beat it. However, to actually see the secret islands in the GBC port (aside from going straight to them in the pointless Time Attack mode) takes an inordinate amount of patience, because as you'd probably guess, the humble GBC is absolutely not up to the task of replicating the arcade game. To be fair, it's not nearly as bad as the rest of the internet says- unlike Classic Bubble Bobble and most of the other Taito GBC games, while the gameplay physics are totally different, the changes don't completely break the game. It's complicated, man. Ptolemy's face appears in a secret-room-within-a-secret-room in 1988's The New Zealand Story. At the very end of Round 2-1, fly above the hollow block with EXTEND letters, then climb the 'ladder' to find a warp. In that secret room, get on the vertical platform below the spikes and shoot the air to be warped here. The worm appears as a rarely-seen enemy in 1990's Don Doko Don (and yes, he still eats other enemies for you). Most of the cast of The Fairyland Story appear in the Parody Mode of 1993's Space Invaders DX, which we've already covered on this site. However, our SIDX page missed out one important detail- the Mothership is replaced with Dracolisk. Exciting!!! Ptolemy herself appears as a 'helper' character in 1994's Bubble Symphony/Bubble Bobble II (well, not that Bubble Bobble II)- there's a selection of scrolls that appear as items which, when collected, summon a character from another Taito game that you can control to kill enemies. Grabbing the purple scroll summons Ptolemy (unlike the other helpers who just fall out of the portal, she actually flies in on her broomstick) who can move, jump around and cast her spell to kill enemies and turn them into collectable cakes. She's not exactly the same colour she was in 1985, but it's close enough (she seems to have turned into a redhead in the intervening nine years). Like all the helpers, though, you have to be careful you don't accidentally slam your character into a nearby enemy while playing with her. 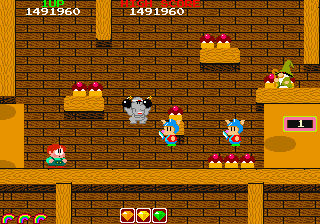 Additionally, a tiara item makes the screen shine and turns all enemies into cake, just like an item in TFLS. Also, one guide to the game said that this is Ptolemy in the background of the fourth treasure room. However, this is actually an altered sprite of an unused boss! It's Super Dranko (thanks, TCRF!). So there we go, mystery solved. Ptolemy appears in Round 57 of 1995's Bubble Memories- any bubbles left when the round ends turn into Ptolemy point items. Like many of the Taito characters appearing as point items (including the dude from Ben Beroh Beh), she gets a whole new sprite here. Also, there are two different Ptolemy items that can appear, depending on the size of the bubbles left on-screen. Now here's a weird one- Ptolemy appears as a selectable character in 2010's i-mode game Daifugo Party, which translates to Millionaire Party- it's a card game. There's not a lot to go on with this particular title, as there's only three things I could really find- Taito's page for the game (which, luckily, had as good a shot of Ptolemy as we're likely to get), a PDF press release for the game (the only source that confirmed it came out in 2010!) and finally, the game's soundtrack on iTunes by ZUNTATA which includes a remix of The Fairyland Story's first half BGM. Other characters that appear in the game (and also have ZUNTATA theme remixes) are Bubblen (Bubble Bobble), Chack'n (Chack'n Pop), Reika Kirishima (Time Gal), Kage (The Legend of Kage), Agent Otto (Elevator Action), Sayo-chan (Kiki Kaikai), Emilio (Psychic Force), a train conductor (Densha de GO!) and who we're fairly certain is Seena (Lufia). The final little cameo is a bit borderline- not an official Taito game, but we're willing to give it a pass. Bubble Bobble: Lost Cave is a 2012 fan-made hack of the arcade Bubble Bobble with 100 new levels, based on home ports of the original. Ptolemy appears as a points item, one that appears at the start of a stage. Her biggest post-introduction appearance is in the Playstation, PC and Game Boy Color versions of the slightly obscure Pop n' Pop, a combination of Puyo Puyo and Space Invaders. Originally released in 1998 in Japan (and 1999 in Europe, if the title screen's to be believed), the Playstation port was never released in the USA, so the game's never really gotten the attention of other Taito puzzlers. The GBC port did get a US release... With all the Taito references taken out. The port's bad, too. It's a shame the US didn't get it, as it's one of their best... But let's stay on topic. While the original arcade game, released in 1997, only has four characters (technically eight if you count the second player palette swaps- it seems to have been rushed somehow), the home versions add a slew of other characters, including Ptolemy (renamed Tremi in the European PS1 version, Treymi in the PC port) along with a green palette-swap called Rodomi, apparently her dragon friend from the original game under a curse from Dracolisk (or Dracoist according to the atrocious translation). 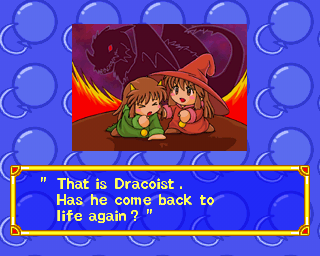 Additionally, Dracolisk appears as a boss of Rounds P and Q, where he spits fireballs at you, as he is wont to do. 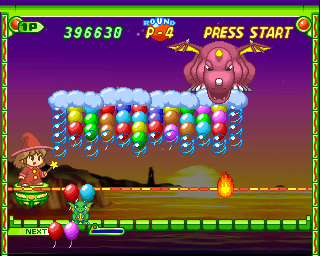 There's a few other nods to Ptolemy's original game- she arrives on-screen with her broomstick, conjures cakes when making a combo, and the moon comes out when using her special balloon, just like the special cake-making item- but more attention gets given to games like The New Zealand Story and Bubble Memories (seriously?). The most important thing to note about Ptolemy's appearance in Pop n' Pop is that she totally breaks the game. Her special balloon is the Star Balloon, which when popped, causes the moon to come out and changes every set of balloons you fire out to a colour and a Rainbow Balloon (which are wild-cards) for a short period of time. 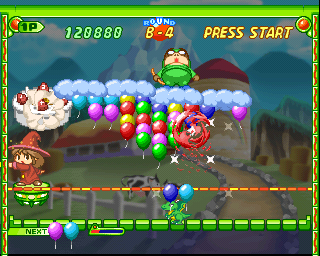 Since the Playstation version has a more relaxed combo system and lets you score combos just by being quick on the draw, you can rack up an insane number of points during this time by matching up balloons as fast as possible- since the Rainbow Balloon will go with anything, you only need one balloon on the board of the colour you've got to pop it. If you can keep a combo up for the Star Balloon's duration, then once it's over and you get the combo bonus, your special meter will probably be full again, and if you get another Star Balloon, you can start the process over. Needless to say, this means she can absolutely murder any other character in Versus Mode, and she also has a much easier time in Story Mode (combos stop the clouds from moving). As an amusing aside, some of the games Ptolemy doesn't cameo in, despite numerous appearances from other Taito characters therein, include Cameltry (Tiki, a rabbit from Don Doko Don and what I think is the ship from S.R.D. Mission appear under certain circumstances) and Space Invaders Get Even (Bubblun, Tiki, Chack'n and Sayo make cameos as bonus items, but not Ptolemy). I'm also willing to bet that she doesn't show up in the otherwise cameo-filled minigame festival Furu Furu Park, but I can't check because a) the game was never released in the UK, and b) it looks absolutely atrocious. And that's your lot. How long will it take for someone to send an angry email detailing all the cameos I missed? LET'S FIND OUT!